Dawn Amano-Ige became the first lady of Hawaiʻi when her husband, Governor David Ige, was sworn in as the 8th governor of the State of Hawaiʻi in December 2014. She is currently a member of the Spouses’ Leadership Committee for the National Governor’s Association. In her role as first lady, Mrs. Ige draws on her experiences as an educator and business woman. She supports education, particularly in the areas of STEAM (science, technology education, arts and math), global education, and international student exchanges. Mrs. Ige was honored in 2016 by the Public School of Hawaii Foundation. Mrs. Ige also promotes healthy living through the Department of Health’s Choose Healthy Now program. Professionally, Mrs. Ige was an educator who most recently served as vice principal of Kanoelani Elementary School and Moanalua High School. Prior to working in school administration, she was a 3rd grade teacher for over 10 years at Waimalu Elementary School. 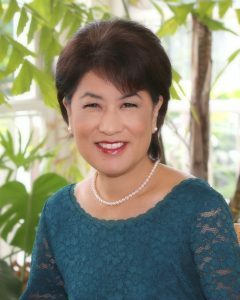 Mrs. Ige previously worked in business as marketing director of Kapiolani Health Care System and as an account executive for the public relations firm of Stryker Weiner Associates. Mrs. Ige was born and raised in Ewa, Hawaiʻi and is a graduate of James Campbell High School in Ewa Beach. She received her bachelor’s degree in journalism from the University of Hawaii, where she met her husband. She also earned a master’s degree business from Chaminade University in Honolulu. After having children, she returned to the University of Hawaiʻi at Manoa for a professional diploma in elementary education. Governor and Mrs. Ige have three children, Lauren, Amy and Matthew, who are currently pursuing their careers on the mainland.